When you classify objects, you organize them into groups based on common characteristics. [Note: The purpose of these questions is to activate prior knowledge and get students thinking. What are some different ways you could classify these marbles? classified by size, color, or pattern. 1. 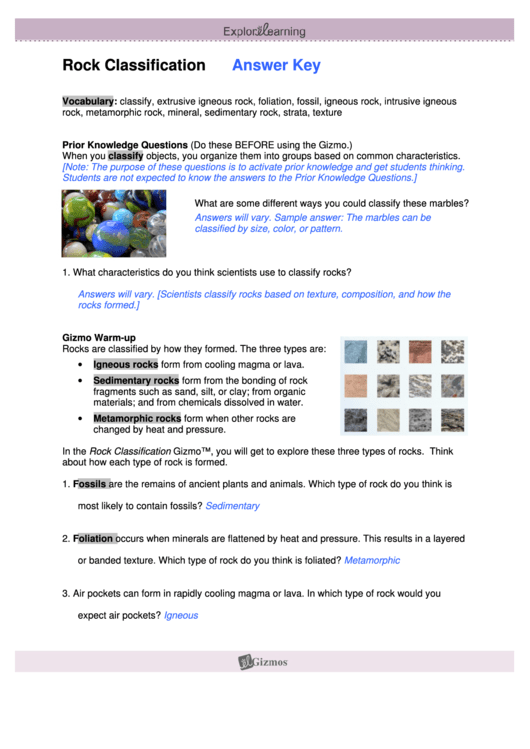 What characteristics do you think scientists use to classify rocks? Igneous rocks form from cooling magma or lava. materials; and from chemicals dissolved in water. changed by heat and pressure. about how each type of rock is formed. most likely to contain fossils? or banded texture. Which type of rock do you think is foliated?